Posted by Wendy in New York Skiing, Resort Review, Whiteface Mountain. Snowmaking is a tough job. It’s a delicate balance between air, water, temperature, pressure, and weather. And if the results aren’t perfect, you could end up costing the resort customers. What’s more, there are hoses to lug, all sorts of mechanical devices to deal with, and hey, it’s cold out there! All this is something Shannon at Whiteface Mountain, NY, knows only too well. 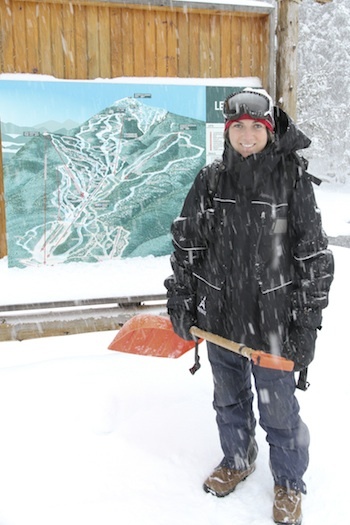 For the past four years, she’s been the only female member of the resort’s snowmaking team. And she loves it. Q: Can you explain a bit about how snowmaking works? A: Snow is made by water and air under really high pressure. It gets pushed up the mountain and out the snow guns. On average, from start to finish, you can get okay coverage in about five days, provided the conditions are right. A week is nice. It all depends on the wind, humidity, temperature, and weather. It has to be really cold, so sometimes we’ll get freezing in the guns and hoses, even in the line. We try to keep everything cleared out and as clean as possible so it keeps circulating. Once it’s going, it’s usually pretty good. Q: How is it being the only woman on the snowmaking team? A: It’s good, although it’s really easy to be singled out or for people to keep tabs on you. The guys can be mistaken for one another. Not me. Initially, I think it was harder, now maybe a bit easier — but I have a little seniority, too. When I first started, most of the guys were not too happy, but it got better each year. The people that mattered, like my boss, noticed I’m a good worker, came in on time, and prepared for whatever job needed to be done that day. My role has changed over the years and I feel like it’s been good. I have a great boss and work with some interesting people. Q: How was the job in the beginning? How has it changed for you? A: I’ve learned a lot — like how to drive a snow cat, the different types of snow guns, how to make snow (how many people even thought of that), the inner workings of a ski mountain. I work alone more now, but I like it. Q: You must have a different perspective than the men on the team. Have you come up with any new ideas on how things can be done? A: My first year there, they were pulling small buckets of slush by hand out of the pit in pump house #1, using rope tied to the handles. The ropes were all wet and would freeze to the door when you were walking out to dump the slush. It sucked, but that’s how they’d done it for years. I noticed a beam directly above the pit and asked why don’t they just put a pulley there. Everyone was amazed that no one had thought of it sooner. Within the day the pulley was up and a carabineer attached to the end of the rope. It’s a lot smoother now. One person pulls the bucket up, detaches it, attaches an empty bucket, and lowers it. The person carrying the bucket doesn’t have a 7 foot rope getting them all wet. You can also use two buckets instead of one per person. So that was my best contribution, in my opinion. Q: What’s a typical day for you? A: I go all over, so it depends where I am. Some of the typical things I do are operate a pump house, move snow guns and hoses, ride a snowmobile, and dig out air and water hydrants to replace them. Q: It seems like a very physically demanding job. Is it dangerous? A: Yeah, it’s a little dangerous sometimes. The most common snowmaking injury is a broken leg. We’re on the trails before there’s any snow and a lot of times it’s just rock and ice and you have to where crampons. It’s almost like mountaineering. You have to carry all the gear and set it all up, so it’s pretty labor intensive. Q: Would you recommend snow making for other women? A: Depends, if you like being outside in the winter and have a cool boss. Plus I get a free liftpass and good overtime. Q: What’s your favorite part about making snow? A: Riding the shovel. We have to walk to each gun, so sometimes we sit on our shovels and slide down to where we want to go. Q: Do you ski or do other snow sports? A: I ride (snowboard) mostly, then occasionally get out to X-C ski, snow shoe and ice climb. Q: Anything else you would like to say to the folks a home? A: Have a good time riding it! Thanks for showcasing Shannon’s awesome work. Kudos to her for taking on such a daunting and fun job.